For the 90-some percent of us for whom a living roof doesn’t make sense, the benefits of such a roof are still attainable. Our experts have weighed in on the various ways to achieve a green roof's benefits without planting your roof. Who wouldn’t want a green roof that doubles as a lovely rooftop garden and the ultimate sustainable home centerpiece? Unfortunately, it only really makes sense for a select few homes with particular structures and settings. For those who could realistically install a green roof, there are a number of considerations, ranging from what to plant to how to irrigate. Check our green roof Q&As to see what other homeowners and contractors are saying about modular green roof products, extensive vs. intensive substrates, and irrigation. For the 90-some percent of us for whom a living roof doesn’t make sense, the benefits of such a roof are still attainable. Susan Wisniewski compiled the following list of green roof benefits, in her Q&A "What's the difference between a green roof and a white roof? ", and our experts have weighed in on the various ways to achieve them without planting your roof. There are also companies out there that offer more sophisticated systems, which filter roof runoff and store the water in tanks. It can then be used for irrigation or for flushing toilets as part of a greywater system. Those with concrete driveways or pathways around their homes may also want to think about installing porous (or permeable) pavement, which allow liquids to pass through them and are thus an excellent method to use stormwater on-site and minimize the environmental impact of pollutants (such as engine oil or antifreeze from parking lots) carried by storm runoff. Check out this Q&A for more details. Plant a sustainable landscape, using native plants and trees. Even if you’ve only got a tiny square of a yard, the addition of native plants can help provide ground cover and habitat for birds, insects and other animals. As an added bonus, the plants will also absorb storm-water runoff. No matter what sort of garden you have, eliminate pesticides and herbicides from it. Architect Tammy Schwolsky, LEED AP, recommends a blend of cloves, vinegar and lemon juices as a natural herbicide, while landscape architect Sherri Osaka has some great tips for a poison free, natural lawn. Both options have the added benefit of making your stormwater runoff less toxic as well. Choosing more durable materials, such as concrete, tiles or metal, will also extend the life the roof membrane, and come with additional energy-efficiency benefits as well. Irrespective of the material, an elastomeric rooftop coating could help extend lifespan as well. Expert Martin Grohman is quick to point out that if your roof is already falling apart, a coating isn’t going to save it, but says that for an intact roof that’s aging, you might find big benefits -- energy savings, reduced thermal stresses, and an extended roof life -- with a coating. There are a number of ways your roof can improve the insulation and energy efficiency of your home without any plants or soil atop it. Cool roof coatings can minimize heat capture, a radiant barrier can reflect heat rather than absorbing it, and insulating your roof from below or above is a great option as well. 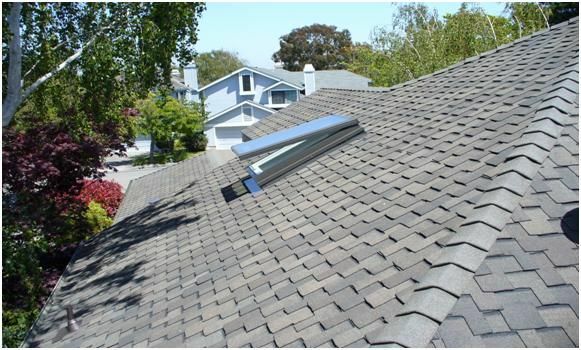 There are many available roofing materials that are both aesthetically pleasing and sustainable. Cool roof coatings are available in myriad colors, EcoStar’s Majestic Slate tiles offer the Arts & Crafts look of wood shake without the durability problems, coated steel roofs can be both visually appealing and a major boost to energy efficiency. Cynthia Phakos outlines these and other options in this Q&A. In addition to rooftop materials and coatings, some may even want to consider a low-profile rooftop solar installation that will both look cool and generate renewable energy. In addition to all their other benefits, green roofs are meant to, as Richard Heller puts it, “replace the piece of ecosystem eliminated by the footprint of the building.” While it’s difficult to go quite that far without the green roof, there are, of course many ways to reduce your home’s footprint. Architect and author Eric Corey Freed suggests starting with heating and cooling in his Q&A "What can I do to reduce my home's carbon footprint? ", but the options range from green landscaping to a low flow toilet to simple things such as programmable thermostats and other ideas for making yours a more energy efficient home.